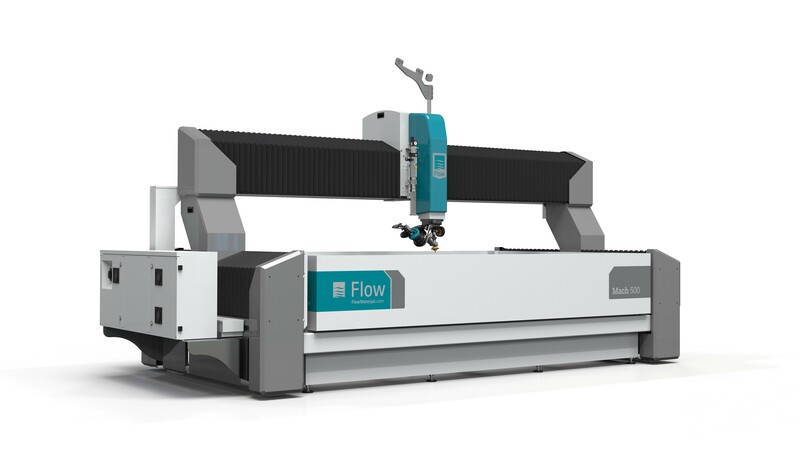 Flow presents the Mach 500, an entirely new waterjet system marking the arrival of a new industry standard. The Mach 500 combines the latest in machine architecture and waterjet cutting technology with comprehensive service and support programs. The main fields of use are machining metals such as aluminium, stainless steel, copper and brass, synthetic and natural stone and composite materials as well as cutting glass and plastics. Together, the latest generation of FlowXpert® 3-D solid modelling CAD/CAM software and the Compass 5-axis contour following and collision sensing solution enable the Mach 500 to make a quantum leap in terms of speed, precision and reliability, significantly boosting productivity. With the Mach 500, Flow has successfully doubled acceleration versus previous models. This means a 15 to 30 percent reduction in cycle time relative to the Mach 3b, the company's best-selling waterjet cutting system worldwide. The Mach 500’s Z travel height is 50 percent larger (305 millimeter) and repeatability (0.03 millimeter) has been doubled. The modern electrical system improves reliability of the overall system and reduces complexity. The latest generation of FlowXpert® CAD/CAM software is capable not only of designing complete 3-D models and assemblies but also of simultaneously calculating optimum cutting paths. Thanks to the modular architecture and numerous configuration options, the Mach 500 can be individually tailored to customer requirements. For example, a range of pump technologies and cutting heads are available. Compass, the optional, patented multiaxial contour following system, has an integral collision sensor and enables precision cutting even on uneven surfaces. Flow provides technologically advanced, environmentally sound solutions to the manufacturing markets. We focus solely on the delivery of high quality waterjet systems and applications expertise. We manufacture every critical part, build every high-pressure pump, and engineer all the software that controls our systems. In addition to a wide program of standard waterjet cutting systems Flow designs and manufactures high productivity ultrahigh-pressure (UHP) abrasive waterjet system solutions for most demanding applications such as the machining of composites. 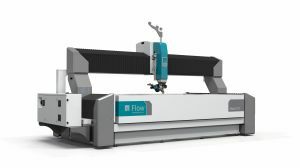 Flow Europe GmbH is a 100% subsidiary of Flow International Corporation in Kent, Washington State, USA, and European Headquarters for all products relating to ultrahigh-pressure waterjet cutting technology. Flow Europe, based in Weiterstadt, Germany, with subsidiaries in Czech Republic, France, Great Britain, Italy, Spain, and UAE, guarantees technical support and availability of consumable and spare parts for all our customers in Europe, Middle East and Africa. The Flow Technology Center is located near Lille, France. With more than 40 years of experience and over 13,000 systems installed Flow is a world leader in the development, engineering and marketing of ultrahigh-pressure pumps and complete 2-D and 3-D waterjet cutting systems for processing a great variety of materials. Flow’s core markets have grown to include aerospace, automotive, job and machine shops, paper, food, art and architecture, and other specialty applications. Approximately 600 employees attend to the concerns of our customers and landmark product innovations. Numerous branch offices and representations create the necessary customer proximity on a worldwide basis.